The small GTPases are a superfamily of enzymes that function as ‘molecular switches’ and are involved in regulating many cellular processes. All small GTPases transduce information through signalling pathways, via alternation between an active GTP-bound and an inactive GDP-bound state. 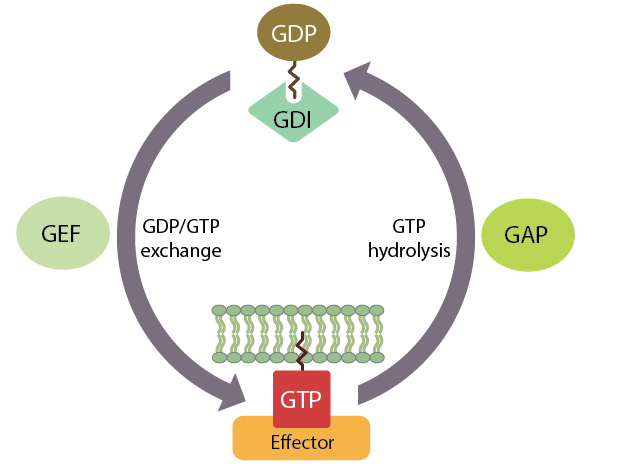 In order to speed up this alternation, the small GTPases are themselves regulated by guanine nucleotide exchange factors (GEFs), which assist in GDP dissociation, and also by GTPase activating proteins (GAPs) that stimulate GTP hydrolysis. Along with GEFs and GAPs, guanine dissociation inhibitors (GDIs) can bind to small GTPases and regulate their location to the membrane or cytoplasm. Small GTPases cycle between a GTP-bound ‘on’ state and a GDP-bound ‘off’ state. In terms of mechanobiology, small GTPases are highly important, having been linked to cell growth, differentiation, proliferation, migration, establishment and maintenance of polarity, vesicle transport and cytoskeletal organisation . The superfamily of small GTPases has been divided into five subfamilies based on sequence and function. These are the original members of the small GTPase superfamily and are major regulators of cell proliferation, differentiation and survival. Key members of the Ras GTPases are Ras, Ral and Rap. Mutations in the Ras subfamily are heavily linked to tumourgenesis, in particular lung, colon and pancreatic cancer . 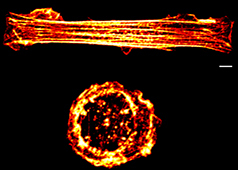 Members of the Rho family are key regulators of actin reorganization and are linked to many processes in mechanobiology. Although there are around 20 members of the Rho GTPase family, research has focused on three members, RhoA, Rac1 and Cdc42. RhoA stimulates the formation of stress fibers by actin polymerisation through the diaphanous-related formins. Rac and Cdc42 stimulate formation of protrusive lamellipodia and filopodia respectively. Unlike RhoA, Rac1 and Cdc42 initiate actin polymerisation by indirect activation of the Arp2/3 complex through members of the Wiskott-Aldrich syndrome protein family (WASP). RhoGTPases can also regulate microtubule cytoskeleton dynamics, predominantly by influencing plus-end binding. Recent work has demonstrated that RhoGTPases are important in integrating mechanotransduction signal pathways, leading to changes in gene expression. Biologically, RhoGTPase regulation of the actin and microtubule cytoskeleton is vital for many cellular processes. For example, during the cell cycle, Rho GTPases influence centrosome positioning, spindle formation and cytokinesis. In non-dividing cells, members of the Rho family are key mediators for establishment and maintenance of cell polarity, cell migration, and cell morphogenesis via lamellipodia and filopodia formation . 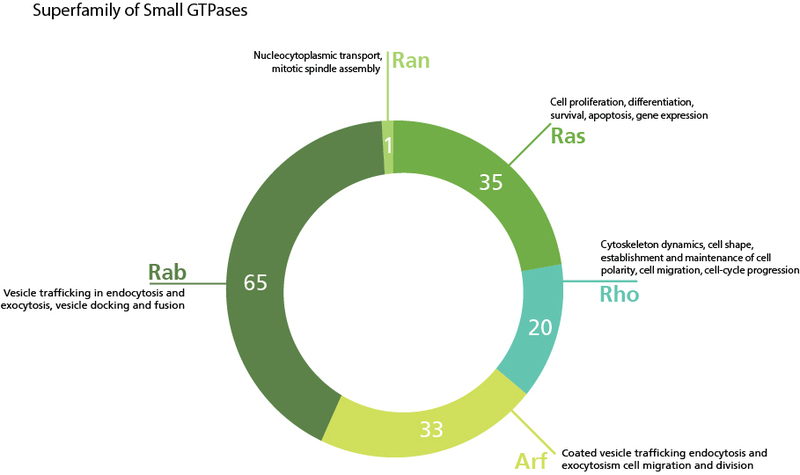 With more than 60 members identified in humans, Rab GTPases form the largest branch of the small GTPase superfamily. Rabs are major regulators of vesicle transport and membrane trafficking in secretory and endocytic pathways. Active GTP-bound Rab localises in the cytoplasm while inactive GDP-bound is inserted into the respective membrane. Some key examples of Rabs include Rab1 and Rab2, which regulate intracellular traffic from the ER to the Golgi, and retrograde traffic back to the ER, respectively. In terms of exo- and endocytosis, Rab3, Rab26, Rab27 and Rab37 associate with secretory vesicles for exocytosis, while Rab5 is involved in fusion of endosomal vesicles during early endocytosis. The importance of membrane trafficking in synaptic transmission has implicated Rabs in various neurological disorders such as Parkinson’s and Huntington’s disease . The Ran GTPase subfamily is primarily known for regulating nucleocytoplasmic transport of RNA and proteins through the nuclear pore, and is also important for mitotic spindle assembly and function. GTP-bound Ran is prevalent in the nucleus whereas the GDP-bound form is found in the cytoplasm. 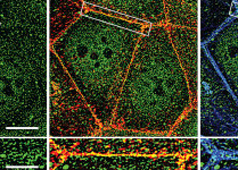 Recently, Rans have been linked to microtubule organisation and cytoskeletal dynamics in neuronal axons . The cellular functions and the number of members for each of the five subfamilies of the small GTPases superfamily. The ADP-ribosylation factor (ARF) small GTPases comprise the Arf proteins, Sar1 and Arf-like (Arl) proteins. Similar to the Rab subfamily, Arfs are highly involved in vesicle transport and membrane trafficking. Arf proteins recruit COPI vesicle coats to the Golgi, while Sar1 recruits COPII vesicle coats to the ER . 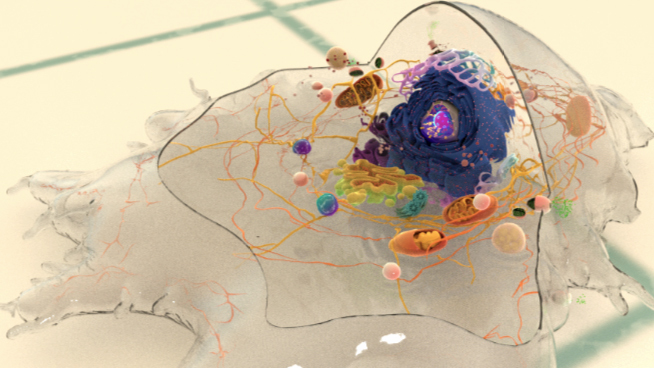 Along with their well-documented roles in membrane trafficking, Arf proteins, in particular Arf1 and 6 have also been linked to actin remodelling during cell migration and phagocytosis, as well as cytokinesis .